Describe something you learned in a place or from someone. How this became useful later in your life? Have you taught it to someone? learning something is an art and a person always learns something in his whole life because of no one could be perfect in his art completely. a human being learns new things at every moment of life.i also learned many things from my childhood from my parents, teachers, friends, and colleagues.but today I would like to talk about a thing which I learned from one of my best friends Manpreet Singh. I learned computer hardware and software installation from him.that is how to check ram, motherboard, hard disc, keyboard, mouse, CPU, and ups. these things became useful for me not only in present era but in my future also. nowadays I am doing PGDCA(postgraduate diploma in computer applications).so I do most of my daily work on the computer. earlier if I had any problem with my computer then I have to contact any user support technician to solve the problem and for which I had to pay large sums of money to him. but I handle any problem on my computer without the help of user support technician. I want to make my career in computer field so it would be great if I have all the knowledge prior to starting my career. the computer becomes the basic need of every person of any age. .even education boards include computer subject in the curriculum of students since their childhood.i have a nephew ParmandeepSinghh Kahlon who studies in UKG and he has a compulsory subject of the computer.so I taught him all the basic things about the computer which became helpful for him in his studies.now he is well aware of all the basic things about computer whether it is hardware or software. Q-1 what do you mean by the method of learning by doing? Ans.in the last time most people learned things theoretically. but with the changing trends in education, some other methods of learning were included in it.one of such methods is learning by doing.it means to do something practically.through this method one could learn not only deeply but very easily also. Q-2 is there any other important method of learning except the one we discussed above? Ans: yes there is another method also and it is known as learning by seeing.it means one could learn not only by reading books or listening lectures but by watching the ideas with their eyes. one such example of this method is the availability of smart classes for the students in schools and colleges. Q-3 when and where do you learn things from people? Ans: I never miss any chance to learn something from people whether they are my parents, relatives, colleagues, students, teachers or old persons.no one is perfect in this world and a person learns things throughout his or her whole life. people should also adopt this habit because this could be beneficial in their future life. Describe something you learned in a place or from someone. Describe something you learned in a place or from someone. Describe something you learned in a place or from someone. Describe something you learned in a place or from someone. 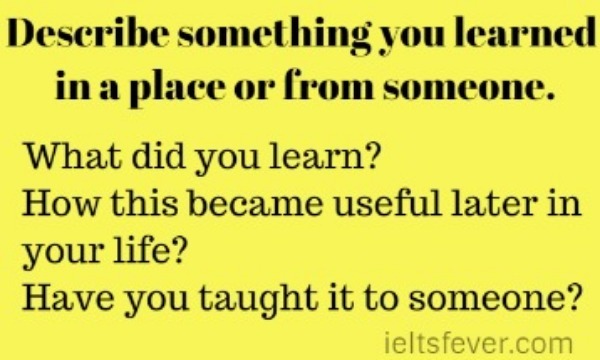 Describe something you learned in a place or from someone.